The figures, dating from approximately the late third century BCE, were discovered in 1974 by local farmers in Lintong County, outside Xi'an, Shaanxi, China. The figures vary in height according to their roles, with the tallest being the generals. The figures include warriors, chariots and horses. 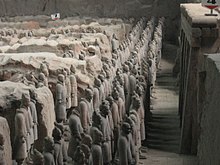 Estimates from 2007 were that the three pits containing the Terracotta Army held more than 8,000 soldiers, 130 chariots with 520 horses, and 150 cavalry horses, the majority of which remained buried in the pits near Qin Shi Huang's mausoleum. Other terracotta non-military figures were found in other pits, including officials, acrobats, strongmen, and musicians. The construction of the tomb was described by historian Sima Qian (145–90 BCE) in his most noted work Shiji, written a century after the mausoleum's completion. Work on the mausoleum began in 246 BCE soon after Emperor Qin (then aged 13) ascended the throne, and the project eventually involved 700,000 workers. Geographer Li Daoyuan, writing six centuries after the First Emperor's death, recorded in Shui Jing Zhu that Mount Li was a favoured location due to its auspicious geology, "famed for its jade mines, its northern side was rich in gold, and its southern side rich in beautiful jade; the First Emperor, covetous of its fine reputation, therefore chose to be buried there". Sima Qian wrote that the First Emperor was buried with palaces, towers, officials, valuable artifacts and wondrous objects. According to this account, 100 flowing rivers were simulated using mercury, and above them the ceiling was decorated with heavenly bodies below which were the features of the land. Some translations of this passage refer to "models" or "imitations"; however, those words were not used in the original text, which makes no mention of the terracotta army. High levels of mercury were found in the soil of the tomb mound, giving credence to Sima Qian's account. Later historical accounts suggested that the tomb had been looted by Xiang Yu, a contender for the throne after the death of the first emperor. However, there are indications that the tomb may not have been plundered. The Terracotta Army was discovered on 29 March 1974 by farmers digging a water well approximately 1.5 kilometres (0.93 mi) east of the Qin Emperor's tomb mound at Mount Li (Lishan), a region riddled with underground springs and watercourses. For centuries, occasional reports mentioned pieces of terracotta figures and fragments of the Qin necropolis – roofing tiles, bricks and chunks of masonry. This discovery prompted Chinese archaeologists, including Zhao Kangmin, to investigate, revealing the largest pottery figurine group ever found. A museum complex has since been constructed over the area, the largest pit being enclosed by a roofed structure. The necropolis was constructed as a microcosm of the emperor's imperial palace or compound, and covers a large area around the tomb mound of the first emperor. The earthen tomb mound is located at the foot of Mount Li and built in a pyramidal shape, and is surrounded by two solidly built rammed earth walls with gateway entrances. The necropolis consists of several offices, halls, stables, other structures as well as an imperial park placed around the tomb mound. The tomb appears to be a hermetically sealed space roughly the size of a football pitch (c. 100 × 75 m). The tomb remains unopened, possibly due to concerns over preservation of its artifacts. For example, after the excavation of the Terracotta Army, the painted surface present on some terracotta figures began to flake and fade. The lacquer covering the paint can curl in fifteen seconds once exposed to Xi'an's dry air and can flake off in just four minutes. Four main pits approximately 7 metres (23 ft) deep have been excavated. These are located approximately 1.5 kilometres (0.93 mi) east of the burial mound. 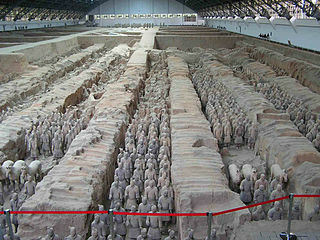 The soldiers within were laid out as if to protect the tomb from the east, where the Qin Emperor's conquered states lay. Pit 1, which is 230 metres (750 ft) long and 62 metres (203 ft) wide, contains the main army of more than 6,000 figures. Pit 1 has eleven corridors, most more than 3 metres (10 ft) wide and paved with small bricks with a wooden ceiling supported by large beams and posts. This design was also used for the tombs of nobles and would have resembled palace hallways when built. The wooden ceilings were covered with reed mats and layers of clay for waterproofing, and then mounded with more soil raising them about 2 to 3 metres (6 ft 7 in to 9 ft 10 in) above the surrounding ground level when completed. Pit 2 has cavalry and infantry units as well as war chariots and is thought to represent a military guard. Pit 3 is the command post, with high-ranking officers and a war chariot. Pit 4 is empty, perhaps left unfinished by its builders. Some of the figures in Pits 1 and 2 show fire damage, while remains of burnt ceiling rafters have also been found. These, together with the missing weapons, have been taken as evidence of the reported looting by Xiang Yu and the subsequent burning of the site, which is thought to have caused the roof to collapse and crush the army figures below. The terracotta figures currently on display have been restored from the fragments. Other pits that formed the necropolis have also been excavated. These pits lie within and outside the walls surrounding the tomb mound. They variously contain bronze carriages, terracotta figures of entertainers such as acrobats and strongmen, officials, stone armour suits, burial sites of horses, rare animals and labourers, as well as bronze cranes and ducks set in an underground park. The terracotta figures are life-sized. They vary in height, uniform, and hairstyle in accordance with rank. Their faces appear to be different for each individual figure; scholars, however, have identified 10 basic face shapes. The figures are of these general types: armored warriors; unarmored infantrymen; cavalrymen who wear a pillbox hat; helmeted drivers of chariots with more armor protection; spear-carrying charioteers; kneeling archers who are armored; standing archers who are not; as well as generals and other lower-ranking officers. There are, however, many variations in the uniforms within the ranks: for example, some may wear shin pads while others not; they may wear either long or short trousers, some of which may be padded; and their body armors vary depending on rank, function, and position in formation. There are also terracotta horses placed among the warrior figures. Some scholars have speculated a possible Hellenistic link to these sculptures, because of the lack of life-sized and realistic sculptures before the Qin dynasty. They argued that potential Greek influence is particularly evident in some terracotta figures such as those of acrobats, combined with findings of European DNA in Xinjiang and rare bronze artifacts made with a lost wax technique known in Greece and Egypt. However, this idea is disputed by scholars who claim that there is "no substantial evidence at all" for contact between ancient Greeks and Chinese builders of the tomb. They argue that such speculations rest on flawed and old "Eurocentric" ideas that assumed other civilizations were incapable of sophisticated artistry and thus foreign artistry must be seen through western traditions. The European DNA found in Xinjiang is also not evidence of Greek influence, because Indo-European civilizations such as the Tocharians had already existed in Xinjiang since 2000 BCE. Furthermore, the lost wax technique has existed in some parts of ancient China since 1500 BCE, , and has existed in northern China since the 6th century BCE - some four (4) centuries before the construction of the terracotta warriors and several centuries before Alexander the Great spread Greek influences to the Near East and Central Asia through his conquests. Most of the figures originally held real weapons, which would have increased their realism. The majority of these weapons were looted shortly after the creation of the army or have rotted away. Despite this, over 40,000 bronze items of weaponry have been recovered, including swords, daggers, spears, lances, battle-axes, scimitars, shields, crossbows, and crossbow triggers. Most of the recovered items are arrowheads, which are usually found in bundles of 100 units. Studies of these arrowheads suggests that they were produced by self-sufficient, autonomous workshops using a process referred to as cellular production or Toyotism. Some weapons were coated with a 10–15 micrometer layer of chromium dioxide before burial that was believed to have protected them from any form of decay for the last 2200 years. However, research in 2019 indicated that the chromium was merely contamination from nearby lacquer, not a means of protecting the weapons. The slightly alkaline pH and small particle size of the burial soil most likely preserved the weapons. The swords contain an alloy of copper, tin, and other elements including nickel, magnesium, and cobalt. Some carry inscriptions that date their manufacture to between 245 and 228 BCE, indicating that they were used before burial. 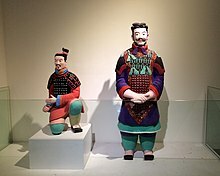 In 2007, scientists at Stanford University and the Advanced Light Source facility in Berkeley, California reported that powder diffraction experiments combined with energy-dispersive X-ray spectroscopy and micro-X-ray fluorescence analysis showed that the process of producing terracotta figures colored with Chinese purple dye consisting of barium copper silicate was derived from the knowledge gained by Taoist alchemists in their attempts to synthesize jade ornaments. Since 2006, an international team of researchers at the UCL Institute of Archaeology have been using analytical chemistry techniques to uncover more details about the production techniques employed in the creation of the Terracotta Army. Using X-ray fluorescence spectrometry of 40,000 bronze arrowheads bundled in groups of 100, the researchers reported that the arrowheads within a single bundle formed a relatively tight cluster that was different from other bundles. In addition, the presence or absence of metal impurities was consistent within bundles. Based on the arrows’ chemical compositions, the researchers concluded that a cellular manufacturing system similar to the one used in a modern Toyota factory, as opposed to a continuous assembly line in the early days of the automobile industry, was employed. Grinding and polishing marks visible under a scanning electron microscope provide evidence for the earliest industrial use of lathes for polishing. Terracotta Warriors exhibition in San Francisco, U.S. The first exhibition of the figures outside of China was held at National Gallery of Victoria (NGV) in Melbourne in 1982. A collection of 120 objects from the mausoleum and 12 terracotta warriors were displayed at the British Museum in London as its special exhibition "The First Emperor: China's Terracotta Army" from 13 September 2007 to April 2008. This exhibition made 2008 the British Museum's most successful year and made the British Museum the United Kingdom's top cultural attraction between 2007 and 2008. The exhibition brought the most visitors to the museum since the King Tutankhamun exhibition in 1972. It was reported that the 400,000 advance tickets sold out so fast that the museum extended its opening hours until midnight. According to The Times, many people had to be turned away, despite the extended hours. During the day of events to mark the Chinese New Year, the crush was so intense that the gates to the museum had to be shut. The Terracotta Army has been described as the only other set of historic artifacts (along with the remnants of wreck of the RMS Titanic) that can draw a crowd by the name alone. Warriors and other artifacts were exhibited to the public at the Forum de Barcelona in Barcelona between 9 May and 26 September 2004. It was their most successful exhibition ever. The same exhibition was presented at the Fundación Canal de Isabel II in Madrid between October 2004 and January 2005, their most successful ever. From December 2009 to May 2010, the exhibition was shown in the Centro Cultural La Moneda in Santiago de Chile. The exhibition traveled to North America and visited museums such as the Asian Art Museum of San Francisco, Bowers Museum in Santa Ana, California, Houston Museum of Natural Science, High Museum of Art in Atlanta, National Geographic Society Museum in Washington, D.C. and the Royal Ontario Museum in Toronto. Subsequently, the exhibition traveled to Sweden and was hosted in the Museum of Far Eastern Antiquities between 28 August 2010 and 20 January 2011. An exhibition entitled 'The First Emperor – China's Entombed Warriors', presenting 120 artifacts was hosted at the Art Gallery of New South Wales, between 2 December 2010 and 13 March 2011. An exhibition entitled "L'Empereur guerrier de Chine et son armée de terre cuite" ("The Warrior-Emperor of China and his terracotta army"), featuring artifacts including statues from the mausoleum, was hosted by the Montreal Museum of Fine Arts from 11 February 2011 to 26 June 2011. 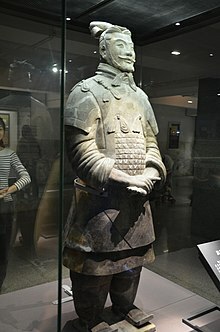 In Italy, from July 2008 to 16 November 2008, five of the warriors of the terracotta army were displayed in Turin at the Museum of Antiquities, and from 16 April 2010 to 5 September 2010 were exposed nine warriors in Milan, at the Royal Palace, at the exhibition entitled "The Two Empires". The group consisted of a horse, a counselor, an archer and six lancers. The "Treasures of Ancient China" exhibition, showcasing two terracotta soldiers and other artifacts, including the Longmen Grottoes Buddhist statues, was held between 19 February 2011 and 7 November 2011 in four locations in India: National Museum of New Delhi, Prince of Wales Museum in Mumbai, Salar Jung Museum in Hyderabad and National Library of India in Kolkata. Soldiers and related items were on display from 15 March 2013 to 17 November 2013, at the Historical Museum of Bern. Several Terracotta Army figures were on display, along with many other objects, in an exhibit entitled "Age of Empires: Chinese Art of the Qin and Han Dynasties" at The Metropolitan Museum of Art in New York City from 3 April 2017, to 16 July 2017. An exhibition featuring ten Terracotta Army figures and other artifacts, "Terracotta Warriors of the First Emperor," was on display at the Pacific Science Center in Seattle, Washington, from 8 April 2017 to 4 September 2017 before traveling to The Franklin Institute in Philadelphia, Pennsylvania, to be exhibited from 30 September 2017 to 4 March 2018 with the addition of augmented reality. An exhibition entitled "China's First Emperor and the Terracotta Warriors" is at the World Museum in Liverpool from 9 February 2018 to 28 October 2018. This is the first time in more than 10 years that the warriors have travelled to the UK. The face of each soldier is constructed to be unique. The Terracotta Warriors were once painted. Today only a handful of statues contain small amounts of paint. Also notice the detail put into the soles of the warrior's shoes. Stone armor suit on display in the National Geographic Museum. ^ Lu Yanchou; Zhang Jingzhao; Xie Jun; Wang Xueli (1988). "TL dating of pottery sherds and baked soil from the Xian Terracotta Army Site, Shaanxi Province, China". International Journal of Radiation Applications and Instrumentation. Part D. Nuclear Tracks and Radiation Measurements. 14 (1–2): 283–286. doi:10.1016/1359-0189(88)90077-5. ^ Portal 2007, p. 167. ^ a b Sima Qian – Shiji Volume 6 《史记·秦始皇本纪》 Original text: 始皇初即位，穿治郦山，及并天下，天下徒送诣七十余万人，穿三泉，下铜而致椁，宫观百官奇器珍怪徙臧满之。令匠作机驽矢，有所穿近者辄射之。以水银为百川江河大海，机相灌输，上具天文，下具地理。以人鱼膏为烛，度不灭者久之。二世曰："先帝后宫非有子者，出焉不宜。" 皆令从死，死者甚众。葬既已下，或言工匠为机，臧皆知之，臧重即泄。大事毕，已臧，闭中羡，下外羡门，尽闭工匠臧者，无复出者。树草木以象山。 Translation: When the First Emperor ascended the throne, the digging and preparation at Mount Li began. After he unified his empire, 700,000 men were sent there from all over his empire. They dug down deep to underground springs, pouring copper to place the outer casing of the coffin. Palaces and viewing towers housing a hundred officials were built and filled with treasures and rare artifacts. Workmen were instructed to make automatic crossbows primed to shoot at intruders. Mercury was used to simulate the hundred rivers, the Yangtze and Yellow River, and the great sea, and set to flow mechanically. Above, the heaven is depicted, below, the geographical features of the land. Candles were made of "mermaid"'s fat which is calculated to burn and not extinguish for a long time. The Second Emperor said: "It is inappropriate for the wives of the late emperor who have no sons to be free", ordered that they should accompany the dead, and a great many died. After the burial, it was suggested that it would be a serious breach if the craftsmen who constructed the tomb and knew of its treasure were to divulge those secrets. Therefore, after the funeral ceremonies had completed, the inner passages and doorways were blocked, and the exit sealed, immediately trapping the workers and craftsmen inside. None could escape. Trees and vegetation were then planted on the tomb mound such that it resembled a hill. ^ Clements 2007, p. 158. ^ Portal 2007, p. 17. ^ Portal 2007, p. 202. ^ Shui Jing Zhu Chapter 19 《水经注·渭水》 Original text: 项羽入关，发之，以三十万人，三十日运物不能穷。关东盗贼，销椁取铜。牧人寻羊，烧之，火延九十日，不能灭。Translation: Xiang Yu entered the gate, sent forth 300,000 men, but they could not finish carrying away his loot in 30 days. Thieves from northeast melted the coffin and took its copper. A shepherd looking for his lost sheep burned the place, the fire lasted 90 days and could not be extinguished. ^ Sima Qian – Shiji Volume 8 《史记·高祖本纪》 Original text: 项羽烧秦宫室，掘始皇帝冢，私收其财物 Translation: Xiang Yu burned the Qin palaces, dug up the First Emperor's tomb, and expropriated his possessions. ^ Han Shu《汉书·楚元王传》：Original text: "项籍焚其宫室营宇，往者咸见发掘，其后牧儿亡羊，羊入其凿，牧者持火照球羊，失火烧其藏椁。" Translation: Xiang burned the palaces and buildings. Later observers witnessed the excavated site. Afterward, a shepherd lost his sheep which went into the dug tunnel; the shepherd held a torch to look for his sheep, and accidentally set fire to the place and burned the coffin. ^ "Royal Chinese treasure discovered". BBC News. 20 October 2005. Retrieved 3 December 2011. ^ Agnew, Neville (3 August 2010). Conservation of Ancient Sites on the Silk Road. Getty Publications. p. 214. ISBN 978-1606060131. Retrieved 11 July 2012. ^ O. Louis Mazzatenta. "Emperor Qin's Terracotta Army". National Geographic. ^ Clements 2007, pp. 155, 157, 158, 160–161, 166 . ^ "Archaeologist Who Uncovered China's 8,000-Man Terra Cotta Army Dies At 82". npr.org. ^ "Army of Terracotta Warriors". Lonely Planet. ^ "Discoveries May Rewrite History of China's Terra-Cotta Warriors". 12 October 2016. Retrieved 12 October 2016. ^ 73号 Qin Ling Bei Lu (1 January 1970). "Google maps". Retrieved 3 December 2011. ^ Clements 2007, p. 160. ^ a b "The First Emperor". Channel4.com. Retrieved 3 December 2011. ^ "Application of geographical methods to explore the underground palace of the Emperor Qin Shi Huang Mausoleum". Retrieved 3 December 2011. ^ Nature (2003). "Terracotta Army saved from crack up". [email protected]. doi:10.1038/news031124-7. Retrieved 3 December 2011. ^ a b "The Necropolis of First Emperor of Qin". History.ucsb.edu. Archived from the original on 20 November 2011. Retrieved 3 December 2011. ^ "The Mausoleum of the First Emperor of the Qin Dynasty and Terracotta Warriors and Horses". China.org.cn. 12 September 2003. Retrieved 3 December 2011. ^ "China unearths 114 new Terracotta Warriors". BBC News. 12 May 2010. Retrieved 3 December 2011. ^ "Terracotta Accessory Pits". Travelchinaguide.com. 10 October 2009. Retrieved 3 December 2011. ^ "Decoding the Mausoleum of Emperor Qin Shihuang". China Daily. 13 May 2010. Retrieved 3 December 2011. ^ a b The Terra Cotta Warriors. National Geographic Museum. p. 27. ^ Cotterell, Maurice (June 2004). The Terracotta Warriors: The Secret Codes of the Emperor's Army. Inner Traditions Bear and Company. pp. 105–112. ISBN 978-1591430339. ^ Cotterell, Maurice (June 2004). The Terracotta Warriors: The Secret Codes of the Emperor's Army. Inner Traditions Bear and Company. pp. 103–105. ISBN 978-1591430339. ^ "Terracotta army emerges in its true colors". China Daily. Retrieved 3 December 2011. ^ "Western contact with China began long before Marco Polo, experts say". BBC. 12 October 2016. ^ Johnston, Ian (13 October 2016). "Ancient Greeks may have built China's famous Terracotta Army – 1,500 years before Marco Polo". Independent.co.uk. Retrieved 14 October 2016. ^ a b Hanink, Johanna; Silva, Felipe Rojas (20 November 2016). "Why China's Terracotta Warriors Are Stirring Controversy". Live Science. Originally published in Hanink, Johanna; Silva, Felipe Rojas (18 November 2016). "Why there's so much backlash to the theory that Greek art inspired China's Terracotta Army". The Conversation. ^ Tocharian Online: Series Introduction Archived 2015-06-29 at the Wayback Machine, Todd B. Krause and Jonathan Slocum, University of Texas as Austin. ^ "A Magic Army for the Emperor". Upf.edu. 1 October 1979. Archived from the original on 28 November 2011. Retrieved 3 December 2011. ^ Portal 2007, p. 170. ^ "Exquisite Weaponry of Terra Cotta Army". Travelchinaguide.com. Retrieved 3 December 2011. ^ Marcos Martinón-Torres; Xiuzhen Janice Li; Andrew Bevan; Yin Xia; Zhao Kun; Thilo Rehren (2011). "Making Weapons for the Terracotta Army". Archaeology International. 13: 65–75. doi:10.5334/ai.1316. ^ Cotterell, Maurice (2004). The Terracotta Warriors: The Secret Codes of the Emperor's Army. Inner Traditions Bear and Company. pp. 99–102. ISBN 978-1591430339. ^ Pinkowski, Jennifer (26 November 2012). "Chinese terra cotta warriors had real, and very carefully made, weapons". The Washington Post. ^ "Terracotta Warriors (Terracotta Army)". China Tour Guide. Retrieved 28 July 2011. ^ Zhewen Luo (1993). China's imperial tombs and mausoleums. Foreign Languages Press. p. 102. ISBN 978-7-119-01619-1. Retrieved 28 June 2010. ^ Martinón-Torres, Marcos; et al. (4 April 2019). "Surface chromium on Terracotta Army bronze weapons is neither an ancient anti-rust treatment nor the reason for their good preservation". Nature - Scientific Reports. 9. Retrieved 5 April 2019. ^ "The First Emperor – China's Terracotta Army – Teacher's Resource Pack" (PDF). British Museum. ^ Bertrand, Loïc; Robinet, Laurianne; Thoury, Mathieu; Janssens, Koen; Cohen, Serge X.; Schöder, Sebastian (26 November 2011). "Cultural heritage and archaeology materials studied by synchrotron spectroscopy and imaging". Applied Physics A. 106 (2): 377–396. doi:10.1007/s00339-011-6686-4. ^ Liu, Z.; Mehta, A.; Tamura, N.; Pickard, D.; Rong, B.; Zhou, T.; Pianetta, P. (November 2007). "Influence of Taoism on the invention of the purple pigment used on the Qin terracotta warriors". Journal of Archaeological Science. 34 (11): 1878–1883. CiteSeerX 10.1.1.381.8552. doi:10.1016/j.jas.2007.01.005. ^ a b Rees, Simon (6 March 2014). "Chemistry unearths the secrets of the Terracotta Army". Education in Chemistry. Vol. 51 no. 2. Royal Society of Chemistry. pp. 22–25. Retrieved 29 March 2014. ^ Martinón-Torres, Marcos; Li, Xiuzhen Janice; Bevan, Andrew; Xia, Yin; Zhao, Kun; Rehren, Thilo (20 October 2012). "Forty Thousand Arms for a Single Emperor: From Chemical Data to the Labor Organization Behind the Bronze Arrows of the Terracotta Army" (PDF). Journal of Archaeological Method and Theory. 21 (3): 534. doi:10.1007/s10816-012-9158-z. ^ Jefferson, Dee (16 December 2018). "China's terracotta warriors will visit Melbourne for National Gallery of Victoria's Winter Masterpieces series". Arts. ABC News. ^ "The First Emperor: China's Terracotta Army". British Museum. ^ a b Higgins, Charlotte (2 July 2008). "Terracotta army makes British Museum favourite attraction". The Guardian. London. Retrieved 25 May 2010. ^ "British Museum sees its most successful year ever". Best Western. 3 July 2008. Archived from the original on 11 October 2008. ^ a b "British Museum ponders 24-hour opening for terracotta warriors". CBC News. 22 November 2007. ^ a b Whitworth, Damian (9 July 2008). "Is the British Museum the greatest museum on earth?". The Times. London. Retrieved 25 May 2010. ^ DesarrolloWeb (19 April 2007). "Los guerreros de Xian, en el Forum de Barcelona". Guiarte.com. Retrieved 3 December 2011. ^ "Guerreros de Xian". Futuropasado.com. Retrieved 3 December 2011. ^ "Llegan a Chile los legendarios Guerreros de Terracota de China". Latercera.com. Archived from the original on 21 October 2011. Retrieved 3 December 2011. ^ "Record-Breaking Terracotta Army Exhibition at Atlanta museum". Archived from the original on 11 July 2011. Retrieved 16 January 2010. ^ "ROM's terracotta warriors show a blockbuster". CBC. 6 January 2011. ^ "China's Terracotta Army, Stockholm, Sweden, Reviews". Retrieved 20 January 2010. ^ "World Famous Terracotta Army Arrives in Stockholm for Exhibition at Ostasiatiska Museum". Retrieved 20 January 2010. ^ "Terracotta warriors, Picassos heading to Sydney". ABC News. 14 October 2010. Retrieved 23 January 2011. ^ "Empereur Guerrier De Chine Et Son Armee De Terre Cuite". Mbam.qc.ca. Archived from the original on 30 September 2011. Retrieved 3 December 2011. ^ "Il Celeste Impero. Guerrieri di terracotta a Torino – Il Sole 24 ORE". ^ "Esercito di Terracotta: dalla Cina a Palazzo Reale di Milano – NanoPress Viaggi". ^ "Die Terrakotta-Krieger sind da". Der Bund. 22 February 2013. Retrieved 21 June 2015. ^ Upchurch, Michael (7 April 2017). "'Terracotta Warriors' exhibit makes grand entrance at Pacific Science Center". Seattle Times. Retrieved 10 July 2017. ^ "Terracotta Warriors of the First Emperor". Pacific Science Center. Archived from the original on 11 July 2017. Retrieved 10 July 2017. ^ "Why the Terracotta Warriors are so special, and how to see them in Philly". Philly.com. Retrieved 3 October 2017. ^ Hurdle, Jon (29 September 2017). "Arming China's Terracotta Warriors – With Your Phone". The New York Times. ISSN 0362-4331. Retrieved 3 October 2017. ^ "World Museum, Liverpool museums". www.liverpoolmuseums.org.uk. Retrieved 5 January 2018. Clements, Jonathan (18 January 2007). The First Emperor of China. Sutton. ISBN 978-0-7509-3960-7. Debaine-Francfort, Corinne (1999). The Search for Ancient China. New Horizons series. Thames & Hudson. ISBN 978-0-500-30095-4. Dillon, Michael (1998). China: A Historical and Cultural Dictionary. Durham East Asia series. Richmond, Surrey: Curzon. ISBN 978-0-7007-0439-2. Portal, Jane (2007). The First Emperor: China's Terracotta Army. Harvard University Press. ISBN 978-0-674-02697-1. Ledderose, Lothar (2000). "A Magic Army for the Emperor". Ten Thousand Things: Module and Mass Production in Chinese Art. The A.W. Mellon Lectures in the Fine Arts. Princeton, NJ: Princeton University Press. ISBN 978-0-691-00957-5. Perkins, Dorothy (2000). Encyclopedia of China: The Essential Reference to China, Its History and Culture. Facts On File. ISBN 978-0-8160-4374-3. 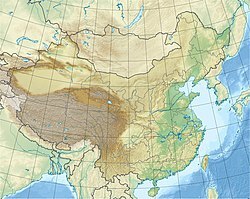 Wikimedia Commons has media related to Terracotta Army. Lintong District, formerly Lintong County, is one of nine districts of Xi'an, the capital of Shaanxi province, China. The Terracotta Army and the Mausoleum of the First Qin Emperor was discovered in March 1974 near this district. The district borders the prefecture-level cities of Xianyang to the northwest and Weinan to the east, Gaoling County to the northeast, Baqiao District to the southeast, Lianhu and Xincheng Districts to the south, and Chang'an District to the southwest. Shaanxi History Museum, which is located to the northwest of the Giant Wild Goose Pagoda in the ancient city Xi'an, in the Shaanxi province of China, is one of the first huge state museums with modern facilities in China and one of the largest. The museum houses over 370,000 items, including murals, paintings, pottery, coins, as well as bronze, gold, and silver objects. The modern museum was built between 1983 and 2001 and its appearance recalls the architectural style of the Tang Dynasty. Sanxingdui is the name of an archaeological site and a major Bronze Age culture in modern Guanghan, Sichuan, China. Largely discovered in 1986, following a preliminary finding in 1929, archaeologists excavated remarkable artifacts that radiocarbon dating placed in the 12th–11th centuries BCE. The type site for the Sanxingdui culture that produced these artifacts, archeologists have identified the locale with the ancient kingdom of Shu. The artifacts are displayed in the Sanxingdui Museum located near the city of Guanghan. The term Chinese pyramids refers to pyramidal shaped structures in China, most of which are ancient mausoleums and burial mounds built to house the remains of several early emperors of China and their imperial relatives. About 38 of them are located around 25 kilometres (16 mi) - 35 kilometres (22 mi) north-west of Xi'an, on the Guanzhong Plains in Shaanxi Province. The most famous is the Mausoleum of the First Qin Emperor, northeast of Xi'an and 1.7 km west of where the Terracotta Warriors were found. Tillya tepe, Tillia tepe or Tillā tapa or is an archaeological site in the northern Afghanistan province of Jowzjan near Sheberghan, excavated in 1978 by a Soviet-Afghan team led by the Greek-Russian archaeologist Viktor Sarianidi, a year before the Soviet invasion of Afghanistan. The hoard is often known as the Bactrian gold. The Qin bronze chariot is a two-piece Qin dynasty bronze artifact. The first piece "bronze chariot one" (一號銅車馬) consists of a driver with two seats in the chariot with a bronze umbrella. The second piece "bronze chariot two" (二號銅車馬) is a separate carriage. Both are about 50% the size of a real horse. The chariot was unearthed in 1980 at the Qin Shi Huang mausoleum. It is one of 64 designated historical artifacts that can never leave Chinese soil. The Mausoleum of the First Qin Emperor is located in Lintong District, Xi'an, Shaanxi province of China. This mausoleum was constructed over 38 years, from 246 to 208 BC, and is situated underneath a 76-meter-tall tomb mound shaped like a truncated pyramid. The layout of the mausoleum is modeled on the Qin capital Xianyang, divided into inner and outer cities. The circumference of the inner city is 2.5 km and the outer is 6.3 km. The tomb is located in the southwest of the inner city and faces east. The main tomb chamber housing the coffin and burial artifacts is the core of the architectural complex of the mausoleum. The Cao Cao Mausoleum, also known as the Gaoling Mausoleum of Wei and the Xigaoxue Tomb No. 2, is a tomb in Xigaoxue Village, Anfeng Township, Anyang County, Anyang City, Henan Province, China. It is purported to be the burial site of Cao Cao, a prominent warlord who lived in the late Eastern Han dynasty. The discovery of the tomb was reported on 27 December 2009 by the Henan Provincial Cultural Heritage Bureau. In 2013, the tomb became part of the seventh batch of Major Historical and Cultural Sites Protected at the National Level in China. The Han Yang Ling, or the Yang Mausoleum of Han, is the mausoleum of Emperor Jing, the sixth emperor of the Western Han Dynasty and his Empress Wang. The mausoleum complex is located in the Weicheng district of the City of Xianyang, Shaanxi Province, on the northern bank of the Wei River and about 20 km to the north of the city center of the provincial capital of Xi’an. The Beijing Dabaotai Western Han Dynasty Mausoleum is a museum built over the tombs of Western Han dynasty prince Liu Jian and his wife at Dabaotai in Fengtai District of southwestern Beijing Municipality about 15 km (9.3 mi) southwest of Beijing's city centre. The two tombs are over 2,000 years old and were discovered in 1974. Also discovered in the vicinity are remnants of a residence from the Jin dynasty (1115–1234). Aydın Archaeological Museum is in Aydın, western Turkey. Established in 1959, it contains numerous statues, tombs, columns and stone carvings from the Hellenistic, Roman, Byzantine, Seljuk and Ottoman periods, unearthed in ancient cities such as Alinda, Alabanda, Amyzon, Harpasa, Magnesia on the Maeander, Mastaura, Myus, Nisa, Orthosia, Piginda, Pygela and Tralleis. The museum also has a section devoted to ancient coin finds. In 2001, the Institute of Archaeology of the Chinese Academy of Social Sciences organized a poll for China's 100 major archaeological discoveries in the 20th century. The participants included eight national-level institutions for archaeology and cultural relics, provincial-level archaeological institutes from 28 provinces, municipalities, and autonomous regions, as well as from Hong Kong, the archaeological departments of 11 major national universities, and many other scholars in Beijing. After three months and three rounds of voting, the results were announced on 29 March 2001 and were published in the journal Kaogu (Archaeology). In 2002, the Chinese Academy of Social Sciences Press published the book China's 100 Major Archaeological Discoveries in the 20th Century (二十世纪中国百项考古大发现), with more than 500 pages and 1,512 pictures.